After a good warm up the game commenced and for the first 5 minutes Truro were on top. Watched by a big Ivybridge crowd, a good day seemed on the cards. Fast forward 20 min and 4 quick and quality Ivybridge scores later, Truro School were wondering if their opponents were solar powered. Credit to Ivybridge as the pace and speed they played with in the opening half was magnificent. At the turn it was 29-0 to the home team. Now the report gets slightly interesting, bear with me.... The second half began with 15 min of Truro dominance. Great running by Jordon Opie in particular got the Ivybridge defences’ attention and large holes began to appear. 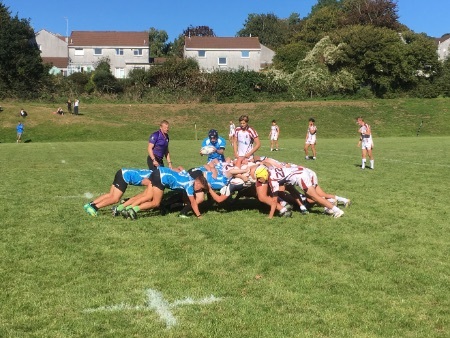 Unfortunately for Truro, some of the boys had their hands on the wrong way round and no fewer than 5 try scoring opportunities were lost. Still, with air in their lungs and blood in their bodies, Truro never stopped competing and it was a source of pride that despite being outclassed in the game, not once did their heads drop. And at the end of the day, all that can be asked is to try your best. Late in the game an exhausted Truro made more mistakes and the ruthless Ivybridge punished every single one. If there was ever a fairly close and competitive 50-0, it was this one. All the boys were a credit to the school. Congratulations to Ivybridge and I hope they can go far in the competition. Truro drop into the Vase and live to fight another day. On a side note the pasties after the game were pleasant but not Cornish. I guess sometimes you take the wins where you can.